I went to the Knoxville Museum of Art to see the Josh Simpson glass exhibition that goes until April 19. I had seen his globlets at art shows and was impressed with his artistry. This exhibition is fun to see his body of work, a Josh Simpson's retrospective, and see the changes and directions that Josh Simpson made. Simpson's planet series pieces were fascinating. I felt as if I was going into the center of these worlds. 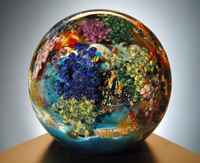 There are some beautiful pieces there and the paperweights are really special for the collector. I'm hoping to make another trip to see the Simpson exhibition and really spend some time with the " Higher Ground: a Century of Visual Art in East Tennessee". I was not aware of some of the artists; but there are some beautiful paintings in this exhibition. Make the time to see these.